With a total length of 1,700 meters, the wall winds north along the ridge to the south bank of Jiujiang River. This river is about 100 meters wide, over which this section of the wall was built, as a bridge with nine arches. The scene is spectacular, with the water flowing east to the Bohai Sea directly. 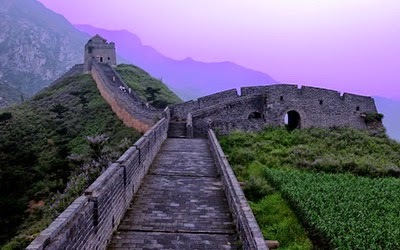 The Jiumenkou Great Wall was a most important pass in Ji Town of the Ming Great Wall. It is located in the boundary of Funing County in Hebei Province and Suzhong County in Liaoning Province, 15km to the south of Shanhaiguan. In the Jiujiang valley where the Great Wall passes through, there were built the Jiumen city bridge over the Jiujiang River, besieged cities and ramparts, which altogether formed the unique strategic passes. Jiumenkou, also called “the stone pavement”, named after the granited paved riverbed of more than 7,000 square meters under the Jiumen city bridge. In the slabs paved along the riverbed there were chiseled dovetail grooves that were mortised with east iron ingots in order to closely clutch all the slabs. The city bridge over the JIujiang River was the main project of Jiumenkou, both ends of which were connected with a small rectangle besieged city on the bank. The small city is 16m long from east to west, and was 12.2m wide. It protrudes from the city bridge, serving the bridge tower and the advance guard blockage pass of the Jiujiang River. The eastern wall of it is connected with the city bridge, and is a border platform of the bridge pier on which a pavilion was built. The city is hollow and could hold more than ten defenders.